The renaissance of Bourbon's renaissance. Psychoanalyst enters a bar and the bartender says, "What's your poison?" The shrink says it's Scotch, but then the boy meets a girl and she says, "Why don't you try Bourbon instead?" And the boy, whom we shall call Kaveh Zamanian for time being, fell in love twice: with the girl called Heather, and with Bourbon. They pulled him down the rabbit hole of passion, beauty and elegance, so Kaveh settled down in Louisville, KY, and founded Rabbit Hole. Joining the exciting renaissance of Bourbon, Kaveh decided to carve his vision into the landscape of the quintessentially American booze, picking the best talent and gear on his way. Behold (with your jaw dropped), he has created an opulent Straight Bourbon Whiskey that's taking awards left and right. 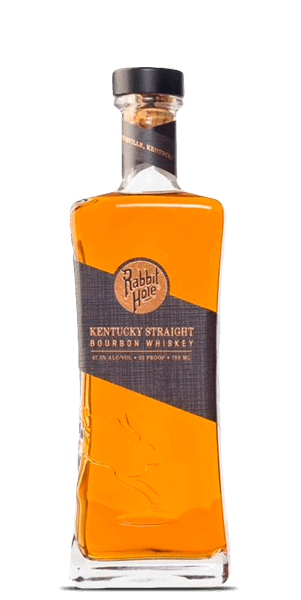 Named simply Rabbit Hole Kentucky Straight Bourbon Whiskey is mature and no-rubbish Spirit with 95 proof and some spice to it. And the secret? Some of it is definitely the rare grain bill: 70% corn, 10% malted barley, 10% honey malted barley and 10% malted wheat. What you get is an exceptionally sweet and rich Bourbon. What does Rabbit Hole Straight Bourbon Whiskey taste like? The Flavor Spiral™ shows the most common flavors that you'll taste in Rabbit Hole Straight Bourbon Whiskey and gives you a chance to have a taste of it before actually tasting it. Young and hot aromas of orange, honey and mint, followed by almond cookies and toasted rye. Rich and sweet, slightly herbaceous. Creamy flavors of orange, honey and mint with hints of toasted grain, followed by ginger and black pepper. A touch of maple syrup and a whisper of smoke. Hot finish with orange and almond aftertaste, and a trail of honey and cinnamon. Alright. It had a lot of botanical taste that were meh. Great flavor. Great price. Great bottle. Everything you would expect from a quality bourbon. At this price point, definitely top 3 on my list. This bourbon is well beyond it’s age. A REAL treat! Love this one. It has become my go to mixer and is also excellent on its own. Carmel, vanilla, light and sipable. It was a very differently flavored bourbon because it contains no rye and two different types of barley and wheat. We found it to be a very welcome and distinct, spicy change from a typical bourbon. Not one of my favorites. Astringent and really young tasting. Expected more for the high price. Will not purchase again. Why did you review twice.. Once was enough.. Should probably delete one. Not one of my favorites. Really astringent and young tasting. The orange and honey dominant flavors pair well with the smoke and pepper making Rabbit Hole Bourbon a pleasure to sip and roll around on the tongue. A single 2 inch cube makes it a perfect drink for the Arizona winter. Great, easy drinking, bourbon. Has just enough bite to remind you it’s still a bourbon too! Definitely will purchase again. Very smooth and complex considering it is such a young bourbon! This is my new favorite bourbon for the price. Very smooth with just right amount of spice. Pretty good, but not once of my absolute favorites. A bit longer finish than I prefer. I’ve had both bourbons and they are both exceptional. This is a classic bourbon with a medium to long finish. Great caramel and vanilla notes with a touch of mint and citrus. Just the right level of spice. It might not be #1 on my list, but it has an argument. An absolutely wonderful, drinkable bourbon. Perfect in a classic Old Fashioned. Not too sweet, a little complex and lovely finish. I toured this distillery and found that they really put an lot of effort into crafting a beautiful product. The Rye is also exceptional. I look forward to other products they will have in the future. Great for such a young distillery.